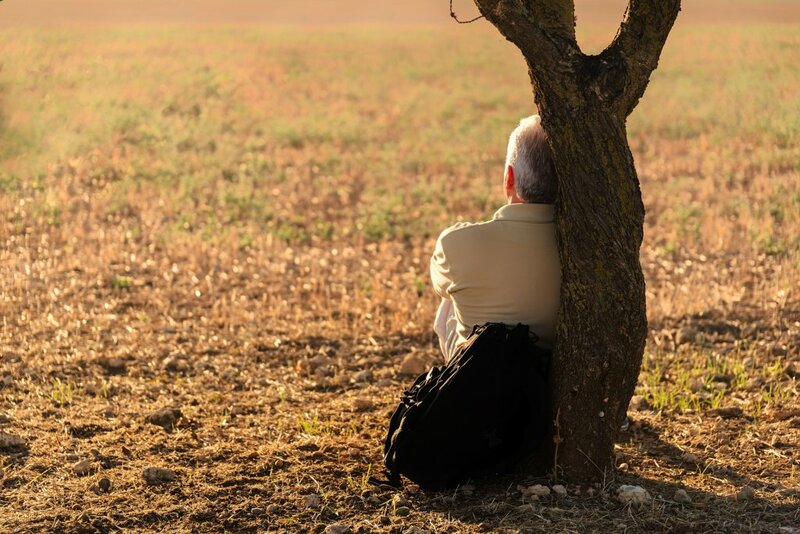 Age-related hearing loss is associated with isolation, depression, and a decline in cognitive function.1,2 And, loneliness and loss of memory are among the top fears experienced by senior citizens. Yet, hearing loss remains an untreated deficit in the majority of individuals who would benefit from intervention. Perhaps the knowledge that hearing aid use may offset or even improve neural and cognitive function may be the incentive needed to pursue help for hearing loss. Indeed, some hearing aid manufacturers have begun to capitalize on the link between hearing loss and cognitive decline in their advertisements. Is there any evidence that supports the efficacy of hearing aid use for improving cognitive function? Yes, there is some indication that hearing aid use has benefits beyond improved hearing ability. A 25-year longitudinal study compared the course of cognitive decline (assessed using the Mini-Mental State Examination3) in 3670 participants ages 65 and older who self-reported moderate or major hearing loss to cognitive decline in participants who self-reported no hearing loss.4 The investigators found that (1) the rate of cognitive decline was steeper in individuals with untreated hearing loss than in individuals who reported normal hearing, and (2) the rate of cognitive decline in individuals who wore hearing aids was equivalent to the rate in the group who reported no hearing difficulty. They concluded that hearing aid use may offset cognitive decline. Both experimental and control groups of participants were fit bilaterally with Widex Dream 440 Fusion hearing aids. Cognitive testing was performed while the participants were wearing hearing aids, and cortical auditory-evoked responses were recorded to a speech syllable /ga/ presented in sound field in aided and unaided conditions. The experimental group wore their hearing aids a minimum of eight hours a day for six months, but the control group did not wear hearing aids during this time. After six months, both groups returned for repeat cognitive testing and cortical recordings. The results showed that cortical amplitude increased in the hearing aid group, particularly for the N1 and P2 peaks, which reflect attention and auditory object identification, respectively (Figure 1). No similar changes were noted in the control group. 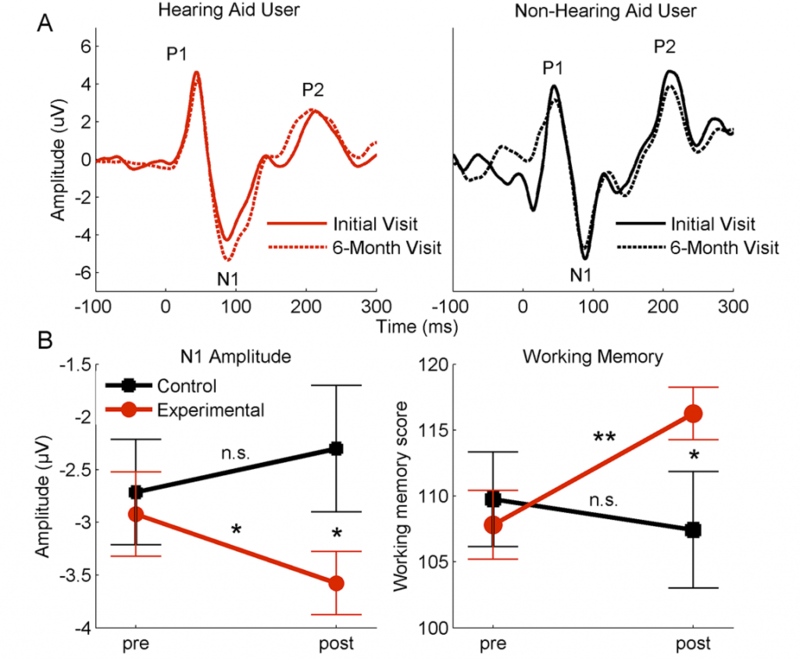 Similarly, working memory scores improved significantly in the hearing aid group (average increase of 8.5 in the standard score), but the scores did not improve in the control group (average decrease of 2.3 in the standard score). No changes were seen in the processing speed or attention/inhibition scores. Interestingly, changes in P2 amplitude were positively correlated with changes in working memory. These findings suggest that improved neural processing and ease of listening through the use of hearing aids may free up brain resources that can be allocated for memory. We hope that for individuals with age-related hearing loss, our study and future studies will provide additional motivation to pursue help for their hearing difficulties. On average, individuals wait seven years from the time they first notice hearing difficulty until they seek help. Perhaps the knowledge that hearing aid use may improve memory ability, in addition to improved hearing ability, will shorten this delay. Heine C and Browning CJ. Communication and psychosocial consequences of sensory loss in older adults: overview and rehabilitation directions. Disabil Rehab 2002;24(15):763–73. Lin F, Yaffe K, Xia J, et al. Hearing loss and cognitive decline in older adults. J Am Med Assoc Int Med 2013;173(4):293–99. Folstein MF, Folstein SE, and McHugh PR. Mini-mental state : A practical method for grading the cognitive state of patients for the clinician. J Psychiatr Res 1975;12(3):189–98. Amieva H, Ouvrard C, Giulioli C, et al., Self‐reported hearing loss, hearing aids, and cognitive decline in elderly adults: a 25‐year study. J Am Geriatr Soc 2015;63(10):2099–104. Karawani H, Jenkins K, and Anderson S. Restoration of sensory input may improve cognitive and neural function. Neuropsychologia Jun;114:203–13. doi: 10.1016/j.neuropsychologia.2018.04.041. 2018.